The menu of the Sequoia represents the vision and principles of our chef, highlighting seasonal and locally sourced ingredients and produce. Thus, the Sarthe region is represented by poultry and eggs from Loué bearing the Label Rouge mark of quality assurance, as well as by beef, escargots and, of course, cheese. Come and discover the thousand flavours of our region, a part of France that is so discreet but has so much to offer! To create his menu, the chef employs his entire palette of skill and experience. 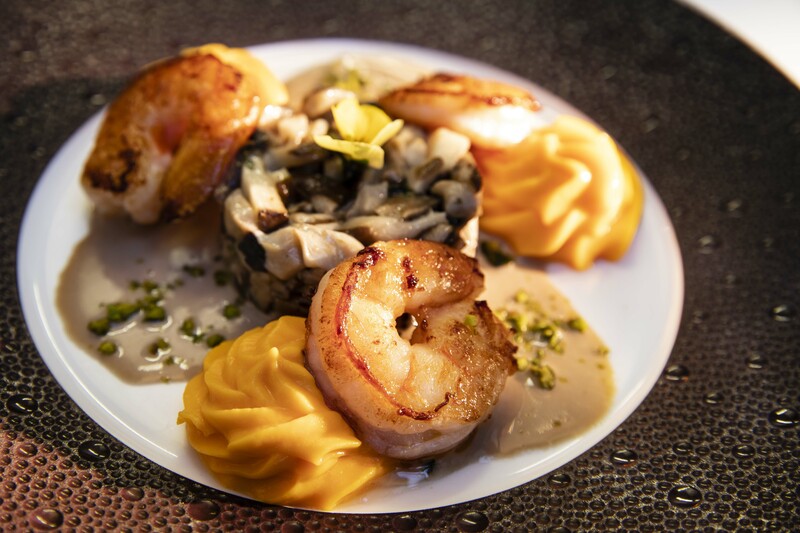 Fans of traditional gastronomy will enjoy Saint-Jacques with leek fondue, rabbit or fillet of beef, while lovers of fusion cuisine will be tempted by the prawns à la plancha accompanied by butternut and shiitake, or the cream cheese with yuzu. The chef has also thought about vegetarians and children and concocted dedicated menus for them that are full of inventiveness. Of course, all dishes are also available à la carte and our sommelier will be happy to advise you in finding the perfect food and wine pairings. Le Mans Country Club promises a unique taste experience to enchant your taste buds with a menu that mixes local delights and exotic delicacies, the produce of the land and of the sea, the traditional and the innovative. Enjoy!